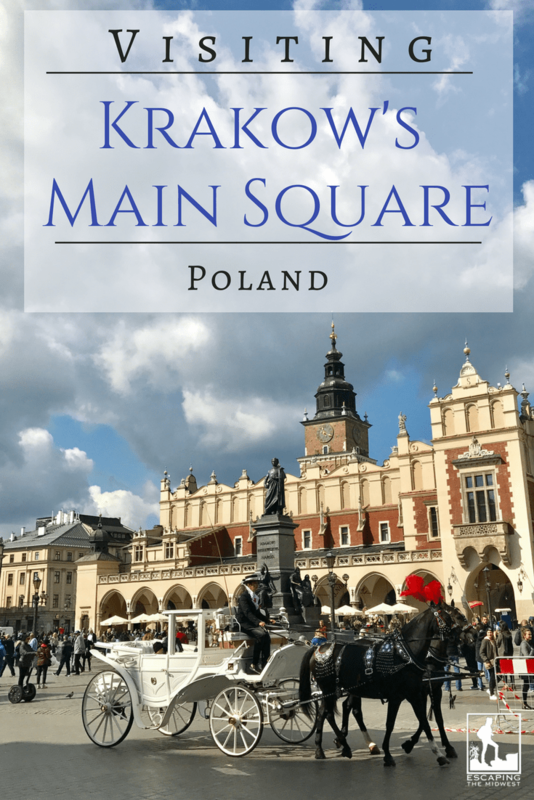 If you’re visiting Krakow, be sure to check out Krakow’s Main Square! It’s Europe’s largest market square and should be towards the top of any touring list. Krakow itself is the second largest city in Poland, as well as one of the oldest. Its historical buildings were saved from the bombs of WWII, thereby preserving a town square that dates back from the medieval 13th century! Krakow’s Main Square (known locally as Rynek Główny) is an amazing historic city center, showcasing urban planning during Poland’s Renaissance and being the preferred location for European merchants centuries ago. It was also listed as one of UNESCO’s World Heritage Sites in 1978. When you arrive at the Main Square, you’ll immediately see the burgundy and cream building in the center – Cloth Hall. Cloth Hall’s history dates to the 14th century, when it was a major center for international trade. Centuries ago, people from the world over flocked to Krakow’s Main Square to deal in trade, even exotic imports from the East. Traders and buyers would be out in the market square, exposed to the elements. Eventually, Cloth Hall was built to protect the merchants and buyers from rain, snow, and inclement weather. After centuries of decline, the building was renovated in the late 19th century and is the building we see today. 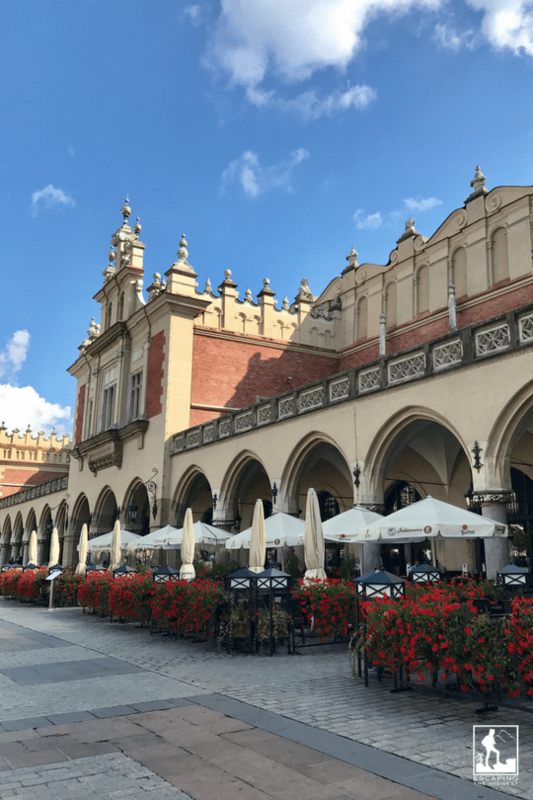 There are plenty of places to eat and drink outside of historic Cloth Hall in Krakow’s Main Square. Inside Cloth Hall, on the upper floor, is the Sukiennice Museum. This museum is the largest permanent exhibit of 19th century Polish paintings and sculptures. 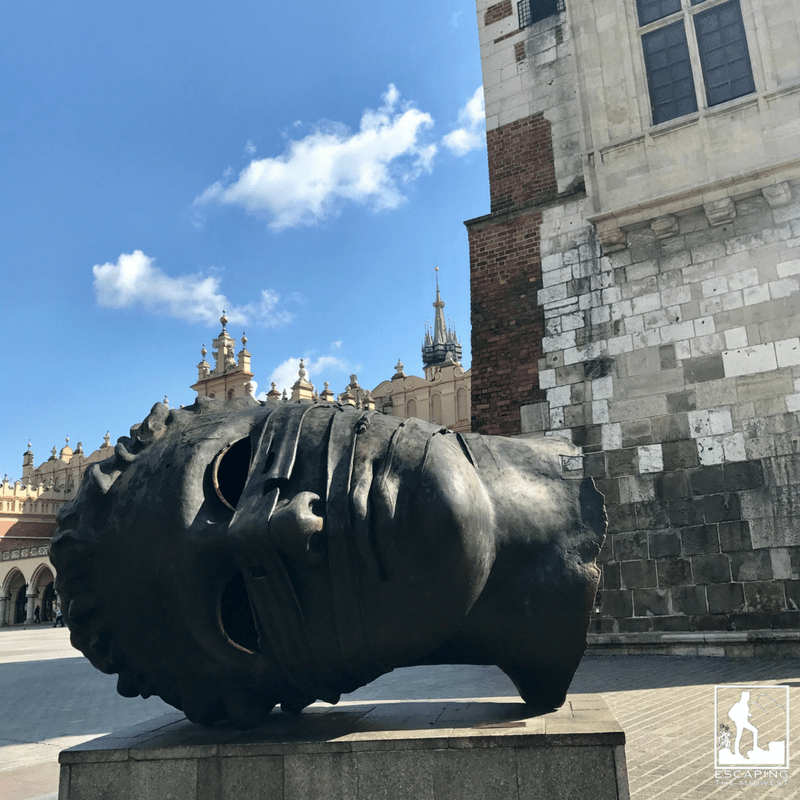 In front of Cloth Hall is a statue of Adam Mickiewicz, a Polish poet, writer, and political activist. His statue is a great central meeting place in the Main Square since it is so big! Inside on the main floor of Cloth Hall, merchants still sell their goods, but now they sell to mostly tourists. Here you can find anything from wood art, to fabrics, to clothes, jewelry, and glass work, as well as various souvenirs. The interior of Cloth Hall, where merchants still sell their goods today. Around Krakow’s Main Square, you’ll find large tour groups, walking tours, small merchants, and lots of birds. When I visited, a few merchants were selling souvenirs and flowers. Watch out for the birds, as they flock to the tourists that feed them. I almost had one hit my head as it flew over me, so keep an eye out! If you’re into romance, you can opt for a carriage ride that takes you around the Main Square and into town. During the day and night, coachmen with ornately decorated horses pulling old-fashioned carriages, line the square, ready for patrons. 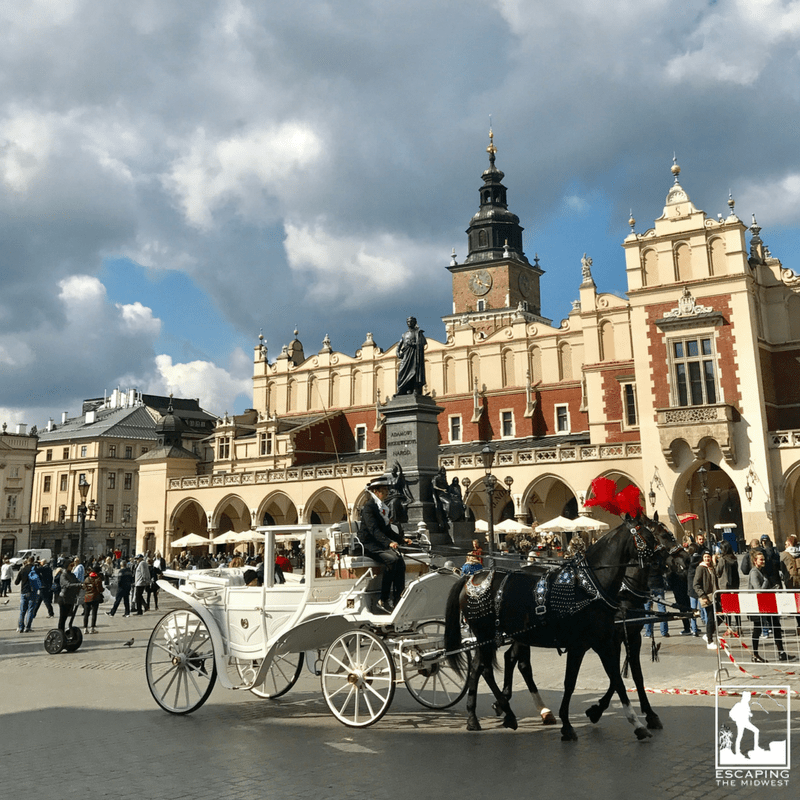 Catch a horse and carriage ride at the Main Square while visiting Krakow. Watch out for the plethora of birds that spend their day in this historic area. 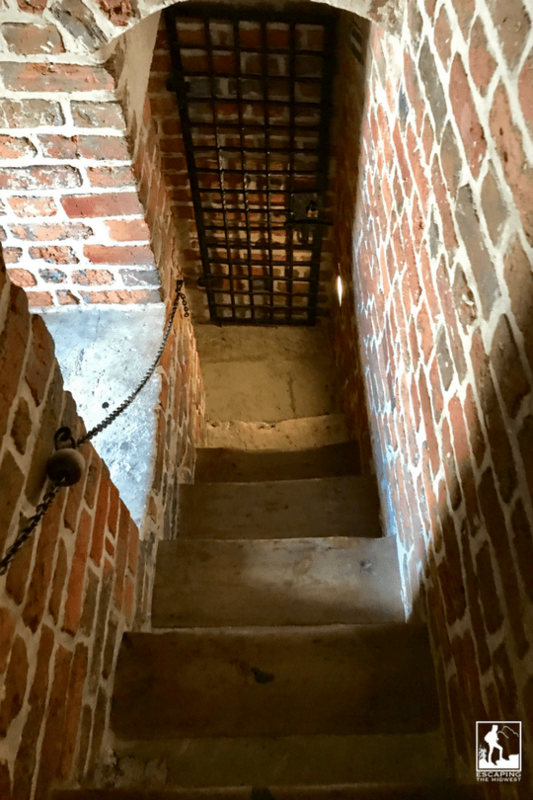 If you’re interested in local history, you can go under Cloth Hall to see the “Rynek Underground” Permanent Exhibition in the basement; learn about the history of Krakow and its Main Square and even see excavated areas. Click here for more information. In the northeast corner of the square, you’ll find St. Mary’s Basilica. Built in the 14th century, this Polish gothic building is still a working Roman Catholic church. Every hour a trumpet is played from the top of the church’s tallest tower, but the music cuts off in the middle of the song; this is done to honor the church’s 13th century trumpet player who was shot in the throat while warning the city of an impending Mongol attack. As it is a working church, it is free to enter daily (hours vary), but only for prayers. To take photos or see the whole church you must pay. St. Mary’s offers tours for a fee. Click here for more information on visiting St. Mary’s Basilica. I love the doors at St. Mary’s Basilica, decorated with the heads of pro­phets, apo­stles, and Polish saints. The plaza next to St. Mary’s Basilica, where you can find info on tours. On the same side of Krakow’s Main Square but in the southeast corner, sits the small Church of St. Wojciech (also known as St. Adalbert’s Church). This church was visited by the merchants that visited Cloth Hall throughout the centuries, as it dates from the 12th century. It is, in fact, one of the oldest stone churches in Poland. Visitation is mostly for small, exclusive concerts due to the limited size of the church. For more information, follow this link. The small square building with the patina dome near the middle of the photo is the church of St. Wojciech/St. Adalbert’s. On the opposite side of this historic square, rises Town Hall Tower. This tower, which also has a clock, was once part of Krakow’s old town hall; however, that building was torn down to open up the Main Square, but the tower was left standing. The tower is 230 feet tall and leans 55 centimeters, which is said to be the result of a storm in 1703. If you feel up to it, you can climb the interior steps to an observatory at the top of the tower. There is no fee to climb up. 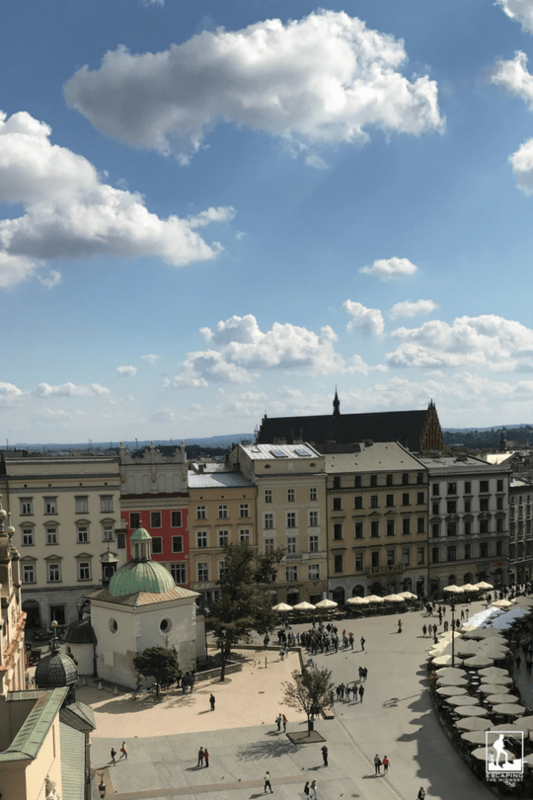 Catch a great glimpse of Krakow’s Main Square from the top! On your way up the very narrow and unevenly spaced stairs, you’ll come across a lookout over an old room within the clock tower. Medieval weapons, clothing, and other artifacts are on display in this room. Watch your head! This is the small doorway in the tower that leads to the stairs. Be sure to stop part way up to see medieval artifacts in the tower. 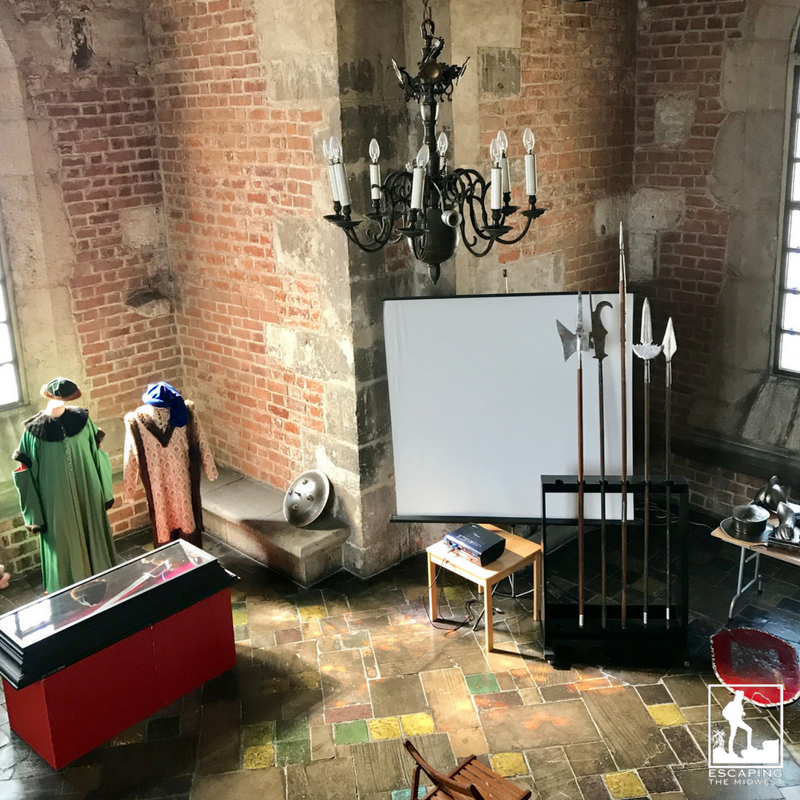 Medieval clothing and weapons in Town Hall Tower. After ascending the steps, you’ll reach the observation floor at the top. Take note that you do not go to the very top of the tower, but rather to the highest set of windows that sit just below the clock face. There are great views of Krakow from here and you can see for miles on a clear day. At the top, you can learn a little bit of Krakow’s history as well as see the parts of the clock mechanism and old bell striker. There is not a lot of room in this observation room so it’s best to visit during off-peak hours. Just outside the clock tower sits a bronze statue of a head, laying on its side. Eros Bendato (Eros Bound) is a bronze sculpture gifted to Krakow by Polish artist Igor Mitoraj. 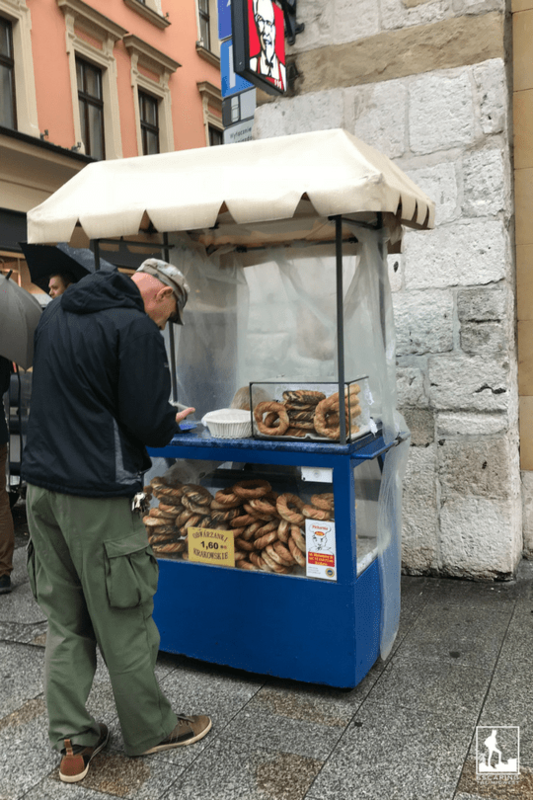 On many street corners, as well as Krakow’s Main Square, you’ll encounter small blue carts of bagels for sale. These infamous chewy, dough rings are called obwarzanek and are usually covered with salt, poppy seeds, or sesame seeds. The obwarzanek is also called the “Cracovian bagel” or the “Jewish bagel.” They are believed to have been part of Krakow’s culture since the late 14th century and are now even a protected regional food. Try and get them when they are fresh, despite having a sell-by date of 3 hours. The obwarzanek sold in the carts are often not very fresh, but they are pretty cheap to try, if you can’t find a fresh one. Blue carts are found around Krakow’s Main Square, selling obwarzanek or Cracovian bagels. If eating Cracovian bagels isn’t your idea of a good meal, you’ll find plenty of options in and around the Square. During the warmer months of the year, you’ll find many outdoor tables and dining establishments here. If you’re in Krakow during the winter months, many of these restaurants have outdoor tables enclosed in tents with heaters. Restaurants line the streets nearby and you can even find a Starbucks in the southwest corner of Krakow’s Main Square. Krakow’s Main Square is an ideal location for a tourist to spend half of a day. Museums, churches, shops, and restaurants are all here. The locals are very accommodating and many can speak English (or can easily find someone who can). Branch out a bit and take a trip to this gem of a Polish city! What are your favorite places to visit in and around Krakow or its Main Square? I’d love to read your thoughts in the comments. 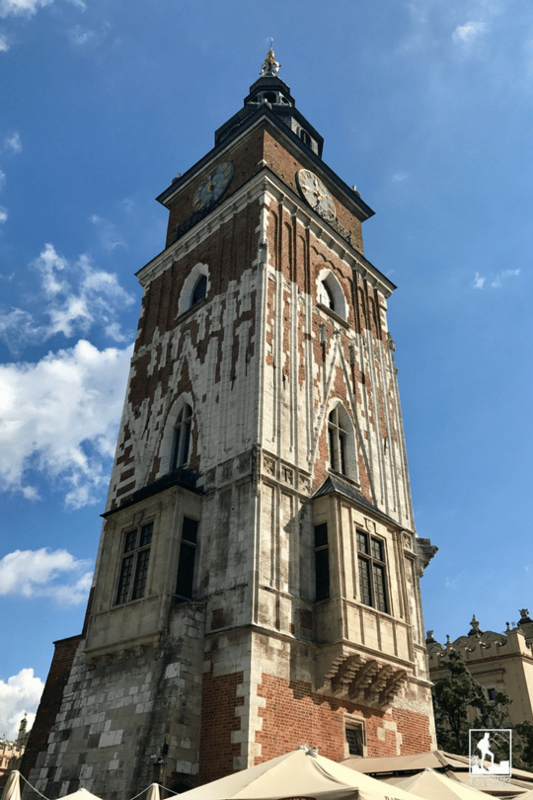 If you’re visiting Krakow, check out my article on the Wieliczka Salt Mine, a great tourist destination, just outside of Krakow.